Many retailers are making the push to modernize their infrastructure through better business intelligence (BI), cloud technologies, and in-memory analytics, but there is a large disconnect between corporate systems and physical stores. Until recently, technology wasn’t sophisticated enough to integrate a store’s point-of-sale (POS) systems into the company’s IT infrastructure. Thanks to IoT, ...retailers have a chance to finally bridge that gap. By using a real-time sensor network that tracks goods continuously within the store, retailers can make their operations smarter, alleviating inventory-based issues, and passing the benefits onto the customer. 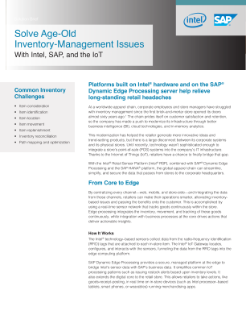 Edge processing integrates the inventory, movement, and tracking of these goods continuously, while integration with business processes at the core drives actions that deliver actionable insights. Discover how Intel® Core™ i7 processors with Intel® vPro™ technology enable innovative retail solutions.